NON-LEAGUE: Great goals for Northern Star, 40 goals in six Stamford matches! Dan Cotton scored twice for Yaxley against Kirby Muxloe. Two stunning goals helped Peterborough Northern Star power to a memorable derby victory yesterday (September 5). Midfield ace Hayden Bream and striker Jacob Joyce both struck twice as Star slammed Deeping Rangers 4-1 at Chestnut Avenue. Bream spectacularly opened the scoring with a 20-yard volley after controlling a Craig Smith header on his chest. He then doubled the advantage from the penalty spot after Smith had been flattened by Deeping goalkeeper Danny Bircham. Jacob Joyce extended the Star lead in magnificent style on the hour when chipping Bircham from inside his own half. Rangers substitute Scott Ginty earned and converted a late penalty but any thoughts of a comeback were soon ended by a Joyce clincher as Deeping boss Michael Goode endured a miserable first return to Star since being axed during last season along with Darren Jarvis. Jarvis’ new side Holbeach are one of three teams now setting the Premier Division pace. They twice came from behind to see off Oadby at Carters Park. They also had to overcome the dismissal of striker Tommy Treacher for violent conduct to prevail 3-2. Treacher had hit their first leveller before player-coach Andrew Tidswell restored parity a second time. Josh Ford then won and tucked away a decisive penalty. Yaxley suffered a first defeat on their new 3G surface at In2itive Park when going down 4-3 at the hands of table-toppers Kirby Muxloe. A Toby Ogbonna strike and a late Dan Cotton brace were not enough to salvage the situation for Ian Benjamin’s side as they were seen off by the unbeaten league newcomers. Wisbech snapped a run of three successive defeats in all competitions by triumphing 2-1 at struggling Northampton Spencer. Striker Chris Bacon struck his first goal since returning to the club inside the opening minute and midfielder Steven Reid doubled their advantage before the hosts hit back later in the first half. Bourne crashed 5-2 at Raunds in Division One. Dan Smith and Jake Mason had hauled the Wakes level during the second half. 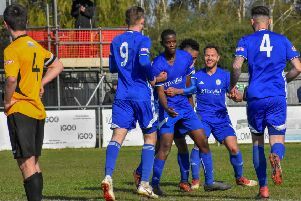 Stamford were undone by a late goal in another high-scoring Evo-Stik League Northern Premier Division thriller. The Daniels went down 4-3 at Blyth after twice levelling and once hitting the front. A Cameron Powell equaliser and a Ryan Robbins strike put them on top after a quarter-of-an-hour, but they were pegged back midway through the first half. Hosts Blyth were back on top early in the second period, but Gregg Smith nipped in to nod Stamford level only for them to concede the decisive goal with five minutes to go. That’s now 40 goals in six games involving Stamford so far this season! Mitch Griffiths scored and was sent off as Spalding suffered a first defeat of the Division One South season. The Tulips went down 2-1 to fellow unbeaten side Stafford Rangers at the Sir Halley Stewart Field. Griffiths halved their arrears late on before ruining their hopes of a dramatic comeback by seeing red for a late challenge.